The Sophie Allport Highland Stag Oilcloth Oundle Bag is a stylish tote shoulder bag named after Sophie Allports local picturesque town Oundle, located on the River Nene in Northamptonshire, England. 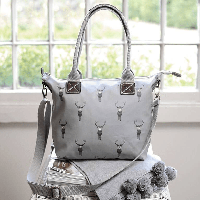 Made from the Highland Stag oilcloth, it's a practical handbag that can be held as a shopper or slung over your shoulder with the adjustable shoulder strap. There's a secure zip closure and handy internal pockets. Plenty of space for all your essentials. Four studs are secured to the base of the bag to protect it from the floor. Dimensions: 13in (base width) x 5in (depth) x 14in (height). 19in (top zip width). 8in handle drop.